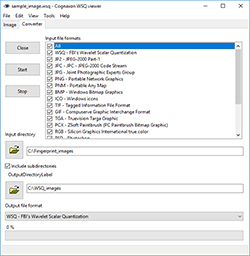 Cognaxon WSQ viewer reads and converts between WSQ and 33 other graphic file formats. WSQ viewer is small (approx. 2 Megabytes) and fast, has image zoom toolbar and supports accelerated navigation through files in the directory using keys page up / page down / home / end . After installation of WSQ viewer *.wsq files can be easily opened in Windows Explorer with simple mouse double click. 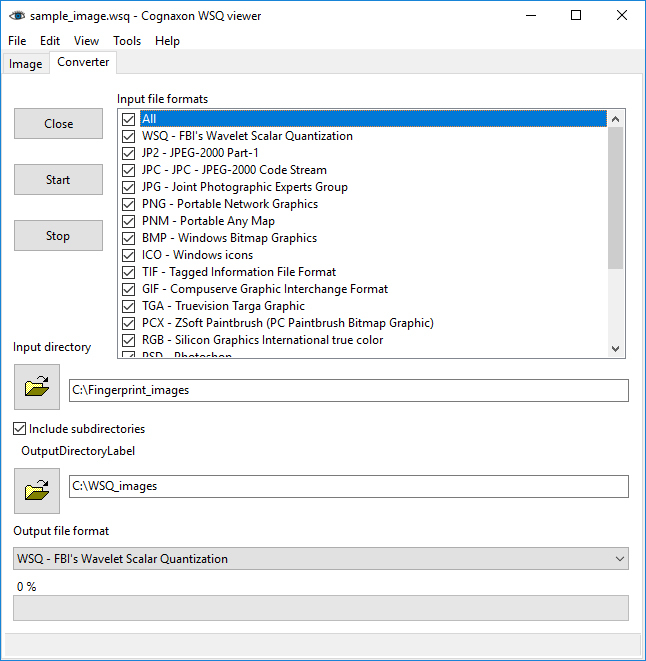 WSQ viewer is the demo version of WSQ (FBI's Wavelet Scalar Quantization) library add-on available as SDK for software developers. Android version of WSQ viewer is available on Google Play. Linux version of WSQ viewer is available here. Windows CE/Windows Mobile/Pocket PC version of WSQ viewer is available here. In the USA, fingerprints have traditionally been collected on cards, each card containing the inked impressions of all ten fingers. The U.S. Federal Bureau of Investigation's fingerprint database began in 1924 with a cataloged collection of 810,188 cards. By the start of World War II, this collection had grown to over 10 million cards, and by 1946 had reached over 100 million cards. In 1995 this collection was contained on over 200 million cards stored in filing cabinets occupying one acre of floor space in the J. Edgar Hoover building in Washington D.C. and archive size was increasing at the rate of 30,000 to 50,000 new cards per day. Digitization of fingerprint cards seemed to be the most obvious choice and the project named FBI's Integrated Automated Fingerprint Identification System (IAFIS) was started to cope with the design and implementation of a national standard for collecting, encoding, storing, and retrieving digitized fingerprint images. According to the FBI standard fingerprints are stored as 8-bit grayscale images. Each fingerprint card, when digitized at 500 dpi requires about 10 Mbytes of storage. The FBI's entire collection would therefore consume two petabytes (2,000,000,000 megabytes) of electronic storage space. The need for an effective compression technique was then very urgent. Unfortunately, neither the well-known lossless methods nor the JPEG methods were found to be satisfactory. Most lossy compression methods, such as JPEG, discard the smallest (highest frequency) details in images, and at higher compression ratios unacceptably distorts the image. Contained within fingerprints are tiny details that are considered admissible points of identification in a court of law. To JPEG, these details may be regarded as noise and removed. The JPEG quantization matrix also allows blocking artifacts to occur in the image at compression ratios above about 10:1. Shifting bits to the high frequencies to preserve small details will only make the blocking worse. Lossless compression methods, such as LZW and JBIG, cannot achieve the high compression ratios of WSQ on fingerprint data, with 2:1 typically being the best. A new compression technique (with small acceptable loss), called Wavelet Scalar Quantization (WSQ) was developed and it became the FBI standard for the compression of 500 dpi fingerprint images. WSQ is a lossy compression method that is well-suited for preserving the very high resolution details of grayscale images while maintaining high compression ratios of typically 12:1 to 15:1 on images that have not undergone "quality enhancements" (such as histogram equalization) to improve the appearance of the image. Name	 FBI's Wavelet Scalar Quantization file format. 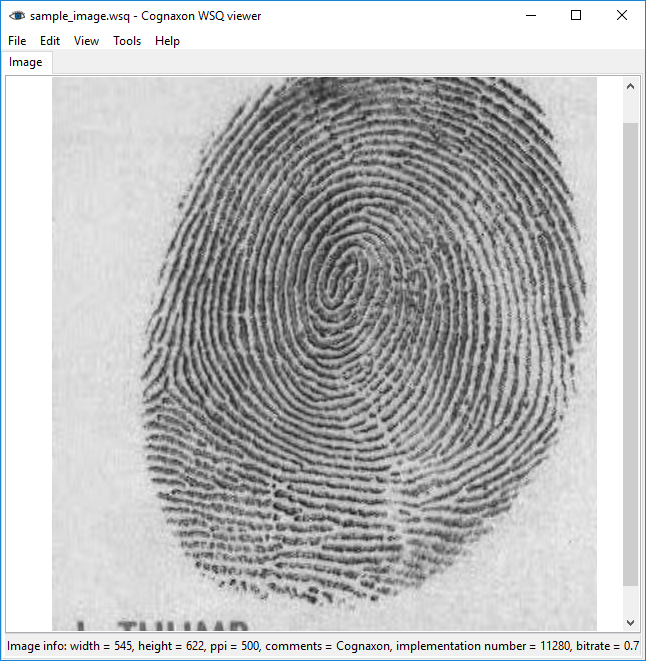 Electronic fingerprints submitted to the FBI either through Integrated Automated Fingerprint Identification System (IAFIS), or Electronic Fingerprint Image Print System (EFIPS) may not be compressed with any technique other than WSQ.